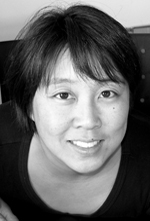 Carla Ayukawa – Evolution Professional Design Consultants Ltd.
Carla is a graduate of Carleton University’s School of Industrial Design (B.I.D ’91). She has been a Professional Member of the Society for Environmental Graphic Design (SEGD) for a long time…. The following are examples of projects Carla has participated in, amongst others. • Design Services for Ottawa Public Library, City of Gloucester, and Upper Canada Village. • Project manager – National Outreach Provincial Linkage Banners (1996, 1997). • Design on the following projects: Canada House; Canada and the World ‘96; Winterfun Poster Challenge; Tulip Legacy; Rideau Canal Skateway; Capital Slide; Canada Day and Winterlude; Confederation Boulevard Banners; National Outreach Provincial Linkage Banners. • Canada and the World – National Capital Commission. • travelling exhibit labels for Iqqaipaa – Canadian Museum of Civilization.